How Is God Different From Your Child’s Imaginary Friend? Does your child have an imaginary friend? Over the years, ours have. Right now its Zeff – an invisible boy who can do, see and be anything our son wants. As such, Zeff comes in very handy. But there’s a problem. Both Zeff and God are invisible. I think this raises a very fair question. 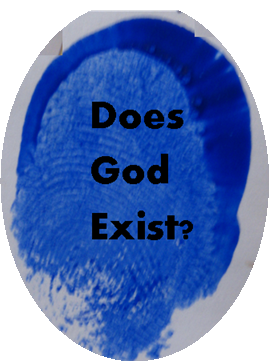 If God is invisible, so to speak, how can we know that He actually exists? Or, to put it in kid language: how is God different from Zeff? Can we prove that God actually exists, even though Zeff doesn’t? I mentioned last week that we know air and love exist because we can feel them and we can see their effects. In a similar way, we can know that God exists by the evidence He leaves behind. I call this evidence His fingerprints. We actually can understand many things about God, including that He exists, from what has been made – because He made it. God has left fingerprints behind for us to discover. These fingerprints provide one line of evidence to confirm that He exists. 1. The Big Bang – A universe with a beginning requires someone or something to begin it. The beginning point of the universe has been nicknamed The Big Bang. As Greg Koukl has quipped: “It seems to me that a ‘Big Bang’ requires a ‘Big Banger’.” A universe with a beginning suggests an all-powerful entity created it. The fact that we have a universe at all is powerful evidence for God. 2. The fine-tuning of the universe – In the last 60 years, more than 30 factors have been discovered that are essential for the universe, solar system and planet to support life. Not only do all of these factors need to be present, but they must be so precisely calibrated that it is all but impossible to speculate that they could co-exist with such precision purely as a result of chance. 3. Molecular machines – Inside your body are incredibly sophisticated, molecular-sized ‘machines’ with numerous finely calibrated, moving parts designed to perform a specific function. In fact, life – including yours – is based on, and supported by, molecular machines. Where did they come from? They could not have been slowly build over time as evolution requires. 4. The fossil record – The fossil record does not show the slow, gradual transitional change that we should see if evolution were true. Surely all the transitional fossils can’t be lost! Rather, the fossil record shows a sudden burst of fully formed organisms appearing all at once and in great variety and complexity. Quite the opposite of evolution, this also is evidence of an all-powerful entity acting upon creation. 5. DNA – Touted as the ‘Language of God’ by Francis Collins, DNA acts like a library where information needed to build critical components in biological organisms is stored. DNA is far more sophisticated than any computer language we’ve ever developed. It’s also extremely specific and absolutely necessary to build life. In order to explain the origin of life, you have to explain the origin of DNA, which thus far, has no naturalistic explanation. This is another sign that God is behind the creation we see all around us, and inside us. Each of the links above contains an explanation of the evidence for god’existence, plus a link to an activity you could try with your children to illustrate and explain it to them. I hope you’ll enjoy the activities as much as we did! ← Theology For Kids: What Does God Look Like? You are really doing a wonderful series here. Thanks for putting forth the time and effort. I followed a number of the links you included and see you have written nicely on a number of these subjects. Well done! I saw a video of Christopher Hitchens saying the fine tuning argument is the strongest argument in the case for God. Another famous atheist, Anthony Flew, came to believe in God due to logic, reason, and science….specifically because of DNA in his case. One note, in your fine tuning article (linked to in this article), the video link for the Veritas presentation doesn’t work. You may want to use https://www.youtube.com/watch?v=Gj_fLi_K7jA for Robin Collins speaking on fine tuning. I wouldn’t say he is the most dynamic speaker but the presentation certainly gives some of the key fine tuning arguments. Thanks so much for your comments and feedback (and encouragement! ), and for pointing out the broken link!